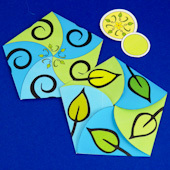 Make an elegant envelope wrap with half-moon-shaped flaps that fold like petals to close. 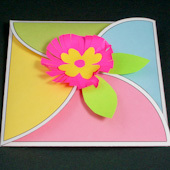 This simple petal envelope is a terrific gift wrap solution for small items like jewelry, gift cards and photos. 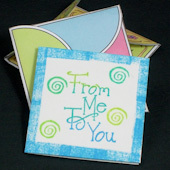 Smaller patterns are also included that are ideal for gift cards. Make several so you always have one on hand when a quick and beautiful gift wrap is needed. Related crafts: In addition to the square, four-petal half-moon envelopes, you can make Five-Petal Pentagon Envelopes. 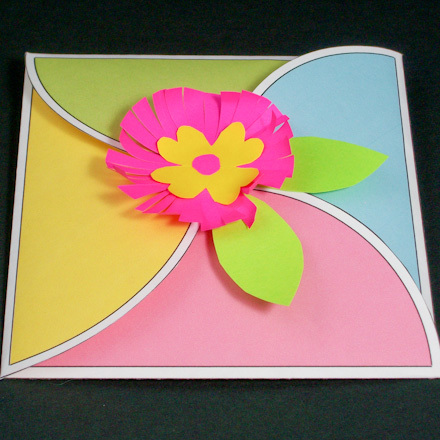 Or use four circles to make Square Petal Envelopes. 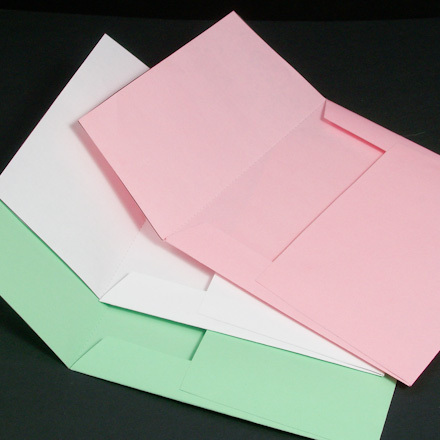 Choose an envelope to make. Download the pattern for the envelope and print it on computer paper or cardstock. 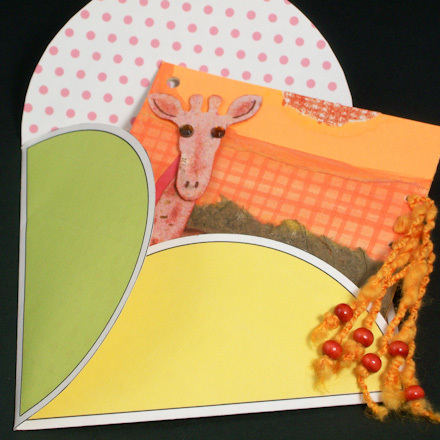 Cardstock will make a sturdy envelope good for multiple uses. 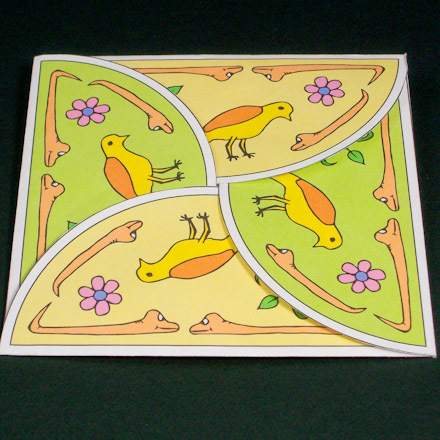 There are three envelope designs with Easter and spring themes. There are also patterns for blank envelopes that are ready for your creative touch. 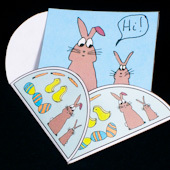 The envelopes are square and come in two sizes: 4 and 5/8" (12 cm) and 2" (5 cm). Use the large size as a gift wrap and the small size for gift cards (or really little gifts). 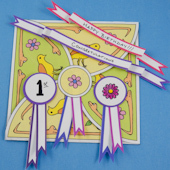 Use these paper ribbons to make closures for the envelopes. See an example in the sidebar. Use colored pencils or markers to add color to the black & white patterns or to add your creative touch to the blank ones. Use your imagination! Cut out the envelope on the outline. Make smooth cuts around the flaps and sharp cuts into the corners. Also cut out the seals at the top of the pattern. The seals can be used to hold the flaps closed, decorate an enclosed letter or card, or in any way you like. Fold each flap over and crease. For cardstock envelopes, score the fold lines first. To close the envelope, fold each flap over in sequence and tuck one side of the last flap under the first flap. 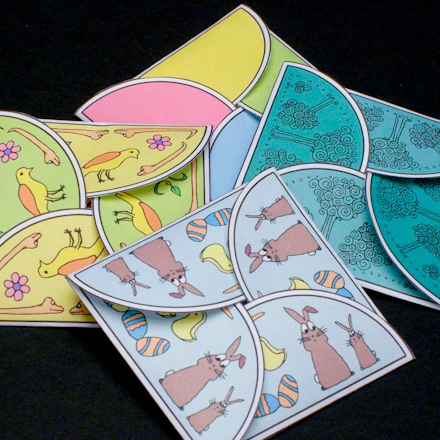 Folding the flaps clockwise and counter-clockwise produces different looks on the envelopes with designs. That's it! What will you put in your envelope? Project extra: Here's a square envelope template for the half-moon petal envelope—to send it through the mail, to protect it or to keep it a surprise. 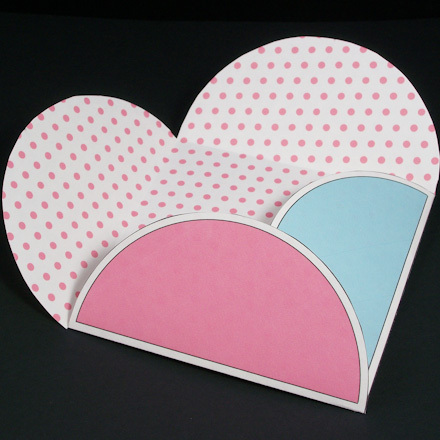 Just print, cut, fold and glue. Tip: Print an ePaper on the reverse side of the cardstock. 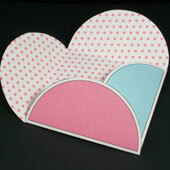 This uses pink polka-dot ePaper. Tip: Seal the envelope with a paper flower. 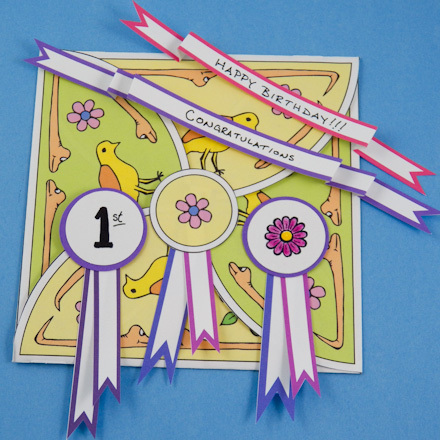 Tip: Use the banner ribbons, and a circle sticker or punch, to create medallion closures for your petal envelope. Tip: The small envelope patterns include gift cards. The 'Hi!' was hand-drawn on the gift card. Tip: To make a gift card for the small envelope, cut a 2" by 4" rectangle, then fold. 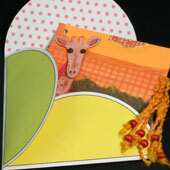 Tip: The envelopes are great for storing keepsakes like this 4-by-4 mini-scrapbook page.